Palm Sunday is the last Sunday of Lent and the first day of Holy Week. On this day, we remember Jesus’ arrival in Jerusalem just days before His betrayal, arrest, torture, and death. But before we get to the difficult part of the story, Palm Sunday recalls how people recognized Him as a savior and welcomed Him to the city with joy and honor. Palm Sunday sets us up perfectly for Holy Week — on one day, we run through all the highs and lows of what lies ahead. It’s a day of drama and instability because the stakes couldn’t be higher: the crowd sees Jesus as a messiah, the authorities get nervous, the crowd turns into a mob when Jesus doesn’t conform to their ideas, and everything goes south. One thing remains constant, though — Jesus’ faithfulness. He never wavers from His commitment to proclaiming the truth of God’s love, even to the point of death. 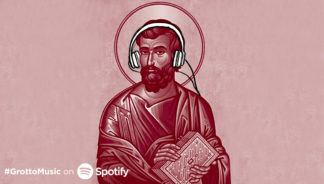 We’ve all had epic days when it feels like the world is crumbling — we made this Spotify playlist to capture the hopeful resilience and faithfulness that anchored Jesus in the crisis of his life. Get inspired and give it a listen today.